Let's get ready to color! Nitrio Coloring Book is dedicated to help kids explore the creative world of coloring. Coloring is a positive activity that will help kids develop their creativity and color sensitivity. The apps are design for child from age 2-8. However adult may enjoy it as well. 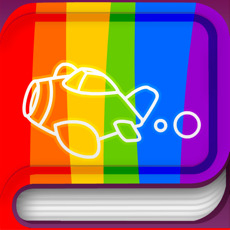 This is the iPhone/iPad app that whole family will be sure to enjoy. - Child friendly user interface. - Come with 19 coloring sheets plus 1 bland sheet. - 18 colorful palette ready. - Help children develop creative thinking. - Easy to reset and start over. If you like our coloring book, please rate this app with 5 stars on App Store so we can keep the surprise updates coming.